Comments: Seven years after Marvel UK's previous Incredible Hulk title ended, Hulk was given another chance to star in his own title, Incredible Hulk Presents. 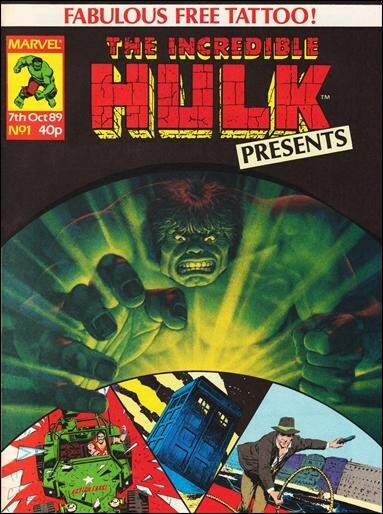 Despite the name, the Hulk didn't present anything, but he did share the title with a rather eclectic mix of Marvel's licensed titles: Indiana Jones from Marvel's adaptation of Indiana Jones and the Last Crusade and then, once that was fully reprinted, from Further Adventures of Indiana Jones; Action Force from GI Joe: Special Missions; and brand new Doctor Who strips aimed at a younger readership than the strip in Doctor Who Magazine. Less than successful, it was cancelled after 12 issues.